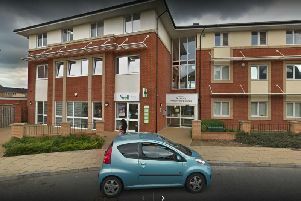 A son will lodge an official complaint to Northampton General Hospital after his mother was readmitted four times only a matter of days after being sent home. Raymond Hughes, 64, who lives with his mother Sheila, 79, in Daventry will also write to his MP Chris Heaton-Harris, health minister Jeremy Hunt and the Care Quality Commission to raise his concerns. Mr Hughes feels aggrieved that his mother, who has dementia, was discharged due to a shortage of beds despite her ill health. “I want something done about this,” said Mr Hughes. “The way they treat old people is despicable. Mum deserves to be treated like anyone else. Mrs Hughes was first admitted to NGH on October 10 with sepsis - a blood infection. Since then she has been discharged three times, but readmitted to the hospital a matter of days after returning home. After being put on antibiotics administered intravenously, Mrs Hughes was discharged after two weeks. Less than a week after returning home his mother “was not well” and “totally not with it” so Mr Hughes called 111 so that she could be taken back to hospital. She was kept in for a week and discharged once more. “Within two days she went down again,” said Mr Hughes of his mother’s condition. Mrs Hughes was admitted to Northampton General Hospital a third time later in November, returned home last Wednesday (November 22), before being re-admitted on Friday, November 24. Prior to his mother’s third discharge from hospital, Mr Hughes claims he was told that Northampton General was under a black alert and had a 100 bed shortage. As a result, they would not be admitting new patients and beds needed to be freed up. “I think this is what happened with my mum,” said Mr Hughes, suspecting his mother had been sent home to free up her bed.